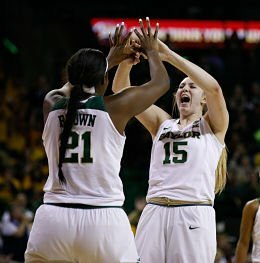 Baylor Bears center Kalani Brown, left, and forward Lauren Cox react after a made basket and foul call on the Texas Longhorns last January. Ray Carlin-USA TODAY Sports, via Baylor Bears. The 18-time and defending Big 12 champs are the obvious favorite to win the conference yet again this year. 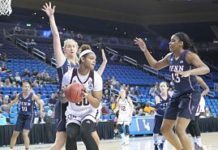 After falling in the conference championship game in 2017 to West Virginia, the Bears rebounded nicely last season and steamrolled their competition, losing only one regular-season game and two overall. They lost in the Sweet Sixteen and finished the season with a No. 9 national ranking. Baylor will undoubtedly have a dominant post presence yet again, led by preseason All-Americans Kalani Brown and Lauren Cox, but the Bears lack experience at the guard position. While there will certainly be a learning curve for the five young freshmen Kim Mulkey brings in, make no mistake that all roads to the Big 12 run through Waco. 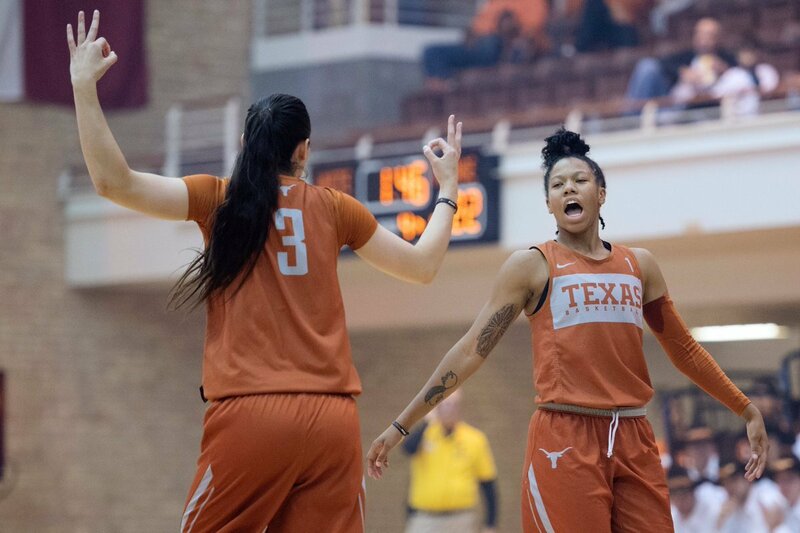 Danni Williams, left, and Sug Sutton celebrate a three-point shot at the “Texas Tipoff” this week. Photo courtesy of Texas Athletics. So Baylor added the No. 3 and No. 7 recruits in the country? No matter: Texas added the No. 2 and No. 8 recruits, according to ESPNW 100. Aside from the Longhorns, there really hasn’t been a legitimate contender to compete with the Bear juggernaut for a regular-season title in recent years. Since January 2015, Karen Aston’s squad has been the only team to defeat Baylor in a Big 12 regular-season game, and they’ll look to do it twice more this year. Texas, like the Bears, loses significant experience in the backcourt with the departures of Ariel Atkins and Brooke McCarty. Junior guard Joyner Holmes is out indefinitely after ankle surgery last week. But the Longhorns bring in a big graduate transfer and a freshman class to be excited about. High-scoring guard Danni Williams, who migrated from Texas A&M, will make an immediate impact. The newcomers have been nicknamed the “Fabulous Five,” led by Charli Collier, as 6-7 Sedona Prince will be sidelined for much of the year after suffering a broken leg at the FIBA U18 games over the summer. Can the country roads team take home a conference championship trophy? Probably not this year, but don’t write off the Mountaineers for a few upsets. Coming off of a disappointing season where they failed to qualify for the NCAA tournament, coach Mike Carey’s squad appears ready to get back on track behind a talented freshman class. While the team loses leading scorer and rebounder Teana Muldrow, sophomore Michigan guard transfer Kysre Gondrezick is the most impressive of the new talent coming in. After she led the Wolverines in scoring two seasons ago, the stage is set for Gondrezick to lead once again, but will it be enough to compete with Baylor and Texas? If one team could be overlooked or a sleeper, it is Iowa State. Losing to Texas in the Big 12 tournament last season left a bad taste in the mouths of the Cyclones – one they’ll hope to wash out with a shot at redemption, as the two meet early in conference play. Iowa State has a significant amount at talent remaining on their roster, despite the transfer of Bride Kennedy-Hopoate and the loss of senior star Emily Durr. While the Cyclones are in desperate need of a post presence (offensively and defensively) and relied heavily on their guards for scoring, they have a true workhorse to carry them to victory in All-American Bridget Carleton. While TCU had prolonged success during the last decade, they have been fighting to renew their winning ways since Raegan Pebley took over the program in 2014. The Horned Frogs finished fifth in the Big 12 last season and lost only two seniors coming into this year. 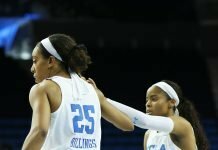 Their hopes for conference success will largely rely on the shoulders of redshirt senior and 2017-18 Big 12 Sixth Man of the Year Amy Okonkwo, along with fellow senior and preseason All-Big 12 center Jordan Moore. TCU’s experience will have to carry them, but how far that will go is anyone’s guess. Under Sherri Coale, the Sooners have qualified for the NCAA Tournament in 19 consecutive seasons since 1999 – the fifth-longest streak of such appearances in the country. Much like TCU, Oklahoma will have to rely heavily the experience of redshirt senior Gileysa Penzo if they hope to continue their streak and compete with their Texas rivals. Without the five who graduated last year, the Sooners lack experience. And like many young teams they will have to find their identity, probably more than once, before conference play starts. Since the arrival of Jim Littell in 2011, the improvement of the Cowgirls has been slow but consistent. Last season the team was often overshadowed by the battle for first between Texas and Baylor. Oklahoma State quietly had another solid season; 11-7 in conference play and 21-11 overall, en route to their fifth-straight NCAA tournament appearance and a nine-seed. However, the Pokes lost a significant presence in All-Americans Kaylee Jensen and Loryn Goodwin, although sophomore guard Braxtin Miller did garner All-Big 12 preseason honors. Nonetheless, despite recent success, their loss of talent will cause them to underwhelm. In 2017-18, Kansas State failed to make the NCAA tournament for the second time under Jeff Mitte, but went three rounds deep in the WNIT. This year, don’t expect things to get much better, as the Wildcats are under-staffed at every position and lack the depth to seriously compete with the top of the division. While the freshman class lends some hope to the future, for now, that’s all it is: hope. An hour and 20 minutes east of Manhattan, the Jayhawks find themselves in an equally-precarious situation. As a team that has won only five Big 12 games over the past three years, all hopes for success for lie on the shoulders of senior guard Christalah Lyons, a former JUCO standout at Trinity Valley Community College. Unless she turns into a Michael Jordan at the end of the bench, don’t expect “Rock Chalk Jayhawk” chants anytime soon. Last, and certainly least, are the Red Raiders. After failing to finish higher than eighth under former coach Candace Whitaker, who was fired near the end of last season, Tech replaced her with Marlene Stollings from Minnesota. While Stollings attempts to get Raiderland back on track to qualify for the NCAA tournament for the first time since 2013, she’ll have to do it with the least-experienced lineup in the conference. Tech has only one senior in forward Zuri Sanders, although they do retain a nice collection of juniors. While there is always a learning curve and early struggles when a new coach takes over a program, the Raiders can’t afford one. Firing Whitaker sent a message: Tech wants to win. Second round, day 2: more upsets?